Nadia graduated from the prestigious Eastman Dental Institute, UCL, in 2017 with a dual qualification in Dental Hygiene and Dental Therapy. She prides herself in providing holistic preventative treatment including personalised oral hygiene instructions to help patients improve the health of their gums. Her preventative approach also includes supporting patients to prevent tooth decay with diet advice, fissure sealants and fluoride varnish applications, as well as management of erosion and dentinal hypersensitivity. Creating a calm and open atmosphere for all her patients is a priority for her as it enables her to get to know her patients and understand their concerns whilst providing a gentle yet effective hygiene scale and polish treatment. As a dental therapist she provides a high standard of restorative treatment for both children and adults, therefore encouraging a positive attitude towards dentistry. 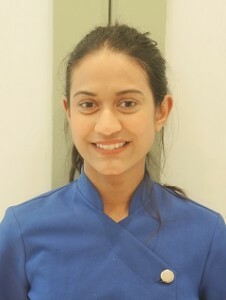 With her biochemistry background, she is passionate about practising evidence based dentistry and keeping up to date with all guidelines and scientific developments with a view to giving her patients the best care. In her spare time Nadia enjoys spending time with her young nieces and nephews, painting & photography.